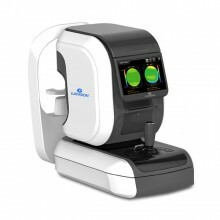 3D Auto Tracking: The cutting edge auto sensor and three-dimensional movement mechanism enable you to track down a measuring focus automatically and complete the measurement perfectly, even with an inexperienced user. High Order Aberration Map: Besides the conventional data such as Spherical, Cylinder and Axis, the high order aberration data is displayed in a graphical Zernike refraction map for better understanding of patient's eyes and superior clinical decision making. Color View Mode: The Full Color CCD camera and white LED light source offer views previously only possible with slit lamps. Motorized Chin rest & Auto Cutting Printer:Motorized chin rest allows to set the height of the measuring point comfortably and quickly. Automatic paper cutting and one touch paper change functions are new advantages of LRK-7800.